Organising the office ‘Christmas do’ is a tough job for office managers and assistants; finding a venue to suit along with a fun activity all takes planning in order to run smoothly. But why put so much effort into the event and then ask employees to make their own way there? Luxury transport can be as much a part of the night as the Christmas party itself, our fleet of six and seven seater vehicles can collect employees and chauffeur them to the surprise location and even deliver them home safely at the end! Employees will travel in style with Wi-Fi, leather ‘captain style’ seating and music entertainment in our vehicles, and if requested we can even offer a few onboard refreshments to help spread the festive cheer whilst on route to the party. Starting the night with a stylish touch will show your loyal team members how much you value them and make sure the all-important Christmas party goes off with a bang right from the start. Please don’t hesitate to contact me if you have any travel needs. You can also get an instant online quote and make a booking on our website. 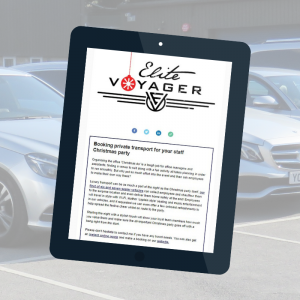 Read our full Christmas newsletter here for 3 benefits of booking private transport and join our database!